Simplicity, objectivity and readability. Those were the main ideas behind the Swiss Style movement. It’s been almost 70 years since Swiss Style took the world of graphic design by storm. But are the principles relevant to today? And can we use them when designing websites and interfaces? Inject Swiss Style into your web designs. Download Justinmind free. Swiss Style, or International Style, refers to a movement that originated in Russia, the Netherlands and Germany during the 1920s and 30s. Designers then spearheaded the movement in the 1950s in Switzerland. Swiss Style is modernist. It is a culmination of Russian constructivism, arts and crafts, photography, De Stijl and the Bauhaus. 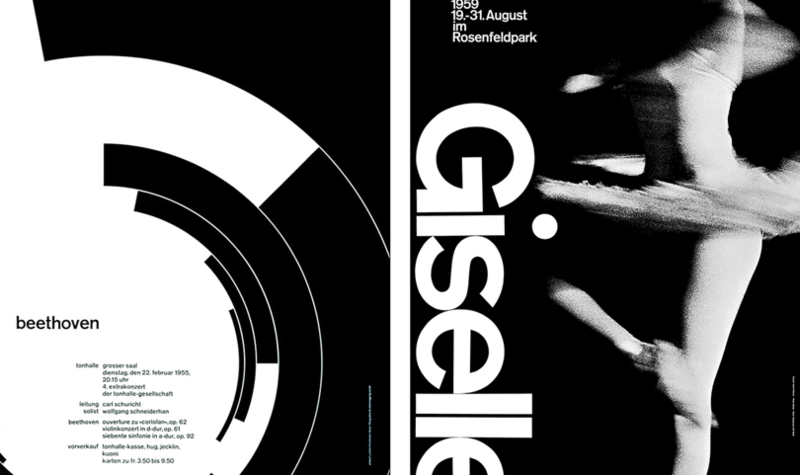 You can identify Swiss Style by its bold headlines, stark composition and minimalist approach. Richard Hollis, author of Swiss Graphic Design, notes the skills associated with Swiss industry, namely pharmaceuticals and mechanical engineering, were matched with graphic designers who would produce advertising and technical literature. The pioneers of Swiss Style saw design as part of industrial production and desperately searched for objective visual communication. Their typography choices, in particular, were industrial. 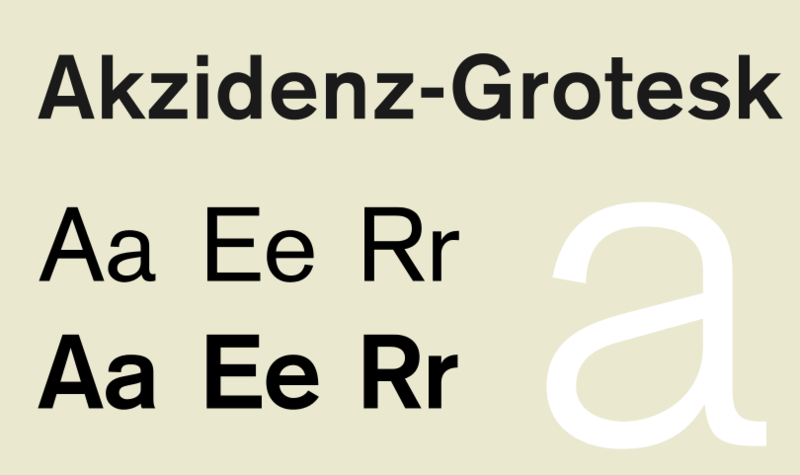 19th Century font Akzidenz-Grotesk influenced Swiss Style greatly. As a typeface, it’s unadorned, general-purpose and functional – everything a modernist would love in a font. It also inspired famous typeface Helvetica. It was designed as a text font. That means it’s readable and why it was used on the New York subway signage in the seventies before Helvetica took its place. The font was used in scientific publications for its clean look which translates well on the web. Aside from graphic design and typography, Swiss Style also found influences in architecture, painting and sculpture. The Barcelona Pavillion is an example. It was built in 1929 and exemplified a modernist approach. So, what characterizes Swiss Style? As the Bauhaus mantra goes: form follows function. That makes Swiss Style pragmatic and considered. This approach is not concerned with beauty either. The beauty is found within the functionality of the design. It’s intentionallyminimal and bare. The idea was that the design should be invisible and the designer’s subjectivity should be suppressed to let the content of speak for itself. UX designers have to take a similar approach when designing. The design isn’t for you so don’t get invested. This applies to all aspects. UX writers can’t become attached to their words just as designers can’t become attached to their interfaces. Swiss Style isn’t only found in posters and other graphic designs. It can be used in web design and UX design. All of the characteristics in the list above can be easily applied to websites. Diogo Terror writes in Smashing Magazine that Swiss Style is in line with creating user-friendly interfaces. The visual characteristics of Swiss Style involve placing elements on a mathematically-constructed grid to create a unified composition. The grid gives the design a structure in which to ‘confine’ your UI elements. This grid should present textual and visual information in a clear way. It doesn’t matter if it’s a poster or an interface; a grid provides order. The font choice should be sans-serif and aligned to the left. The end result should be an asymmetrical design. It’s vital a tool that designer can manipulate to their advantage when creating coherent, usable and crucially accessible user interfaces. What other ways can designers bring the Swiss Style flair to web design? 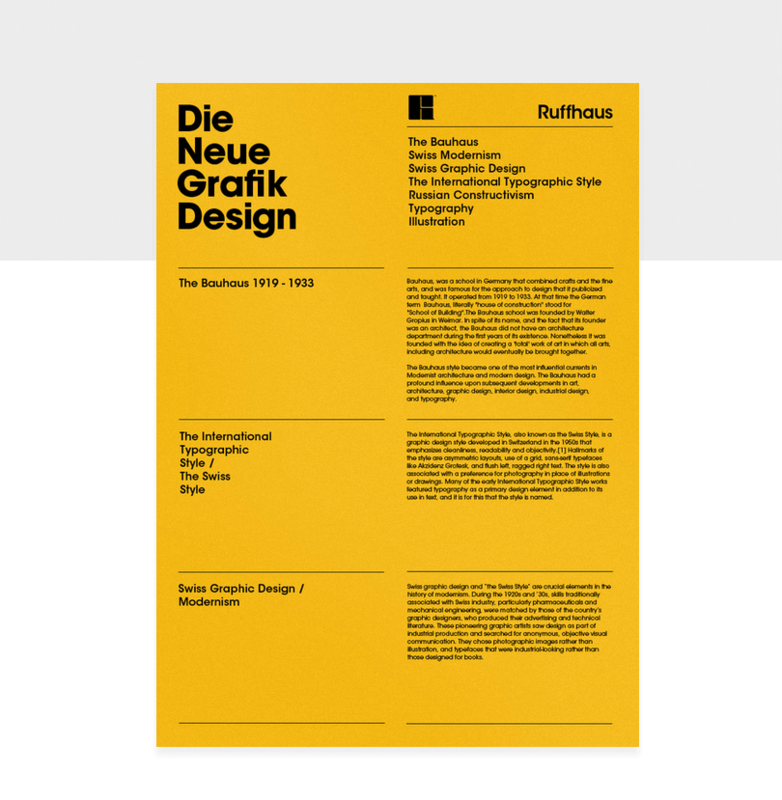 Swiss design is characterized by functional elements on a page. Each element is there for a reason. This philosophy is reminiscent of minimalism. But why should your design be minimal? When you reduce your website design to the only elements that really need to be there, you’re creating clarity in your design. Above is a Swiss Style inspired website template. There is large text with a clear message. Our attention doesn’t jump around because there are only a few colors: white, blue and black. And because of the limited number of UI elements, it’s clear what the website stands for. A busy design, in contrast, will cause confusion. It will create tension. Design is an attempt to deliver a message and if that message can’t be heard over the noise of other competing elements then the user is going to have a less than enjoyable experience. You owe it to your users to give them the information they’re seeking in a way that doesn’t hurt them. Product designer Joshua Porter writes that clarity is job number one in interface design. Joshua goes on to say that to be effective, people must recognize what it is, care about why they would use it and understand what the interface is helping them interact with. In essence, clarity inspires confidence and leads to further use. Your font choice is critical when it comes to Swiss Style web design. Swiss Style is also known as International Typographic Style. As such, the style respect type. Type is the primary design element in Swiss Style. Look at any poster from the period and you’ll see big, bold fonts taking up much of the space. Take a look at these must-read typography books for designers. If you want your web design to embody the Swiss Style then it’s time to throw out your Times New Romans, Garamonds and Caslons. No serif fonts allowed. Let’s look at the website above. The goal is clear: become a member. There are two reasons why our focus is drawn to this. One is the size. The font is large and the message is clear. There are no other conflicting messages. The other is because of the negative space. There’s a lot of it. This allows the website to breathe, convey the message better and gives the user one thing to focus on. Fonts to consider for Swiss Style: Montserrat, Open Sans, Lato and Helvetica. Why not find out how typography can enhance brand identity? A lot of Swiss Style is getting the font and layout right. This involves creating a typographic hierarchy. 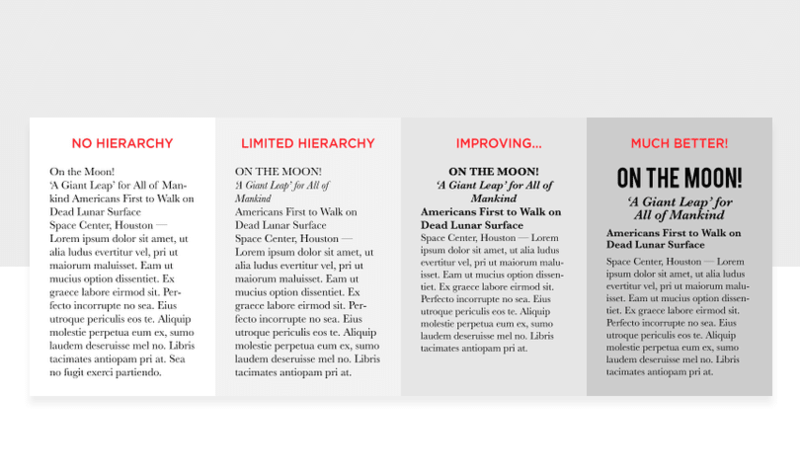 A typographic hierarchy is a way to structure your website’s content by prioritizing information in a coherent way. That means: important stuff first, less important stuff later. If you want a lesson in visual hierarchy, look at the front page of a newspaper. 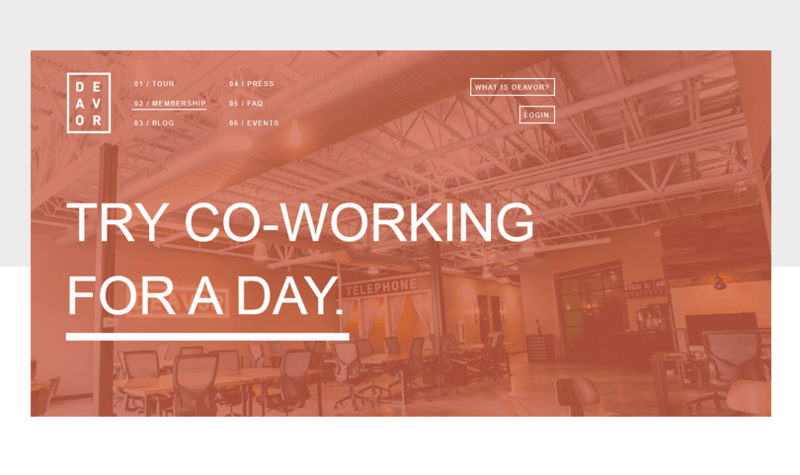 The headline, subheading and body copy are ways to create a visual hierarchy. With a newspaper the headline grabs attention (most important thing) and the subheadings give extra information (less important) and then you have the body copy (least important). Both the headline and the subheadings are used to entice the reader to continue on to the body copy. For the most part, people read in an F pattern, particularly if there is a lot of copy. For sites with less copy, people tend to read in a Z pattern. This is because they’re scanning the page for the information relevant to them. These are the natural eye movement patterns. With this in mind you can start to create a typographic hierarchy. If you know people read left to right and in a Z pattern then you can organize your content to grab the user’s attention by placing the content in the right order. Organizing your content in this way will give it structure. By playing with the sizes of the fonts, you can make information more important to the reader or less important. It makes reading your content much more efficient for the reader. Illustration is going through a boom in web design. Companies of all kinds use bespoke illustration to add charm and personality to a brand. But for Swiss Style, it’s all about photography. Why? In the minds of the designers at the time, photography was a way to represent reality. It is a more objective medium (remember, these guys love objectivity) than drawing or illustration. As we can see, they work together. Both enhance one another. When we look back at the movements that shaped the world and try to recreate our own designs, the end result can be pastiche. As designers, it’s better to find out which elements of a movement worked, which principles stand the test of time and apply those to your design. In trying to recreate Swiss Style the end result will only pale in comparison because we’re no longer of that time. But there are characteristics like choosing your UI elements carefully or paying close attention to type that will always benefit your design.